Basis for the first victory was certainly the lower consumption of the hybrid compared to the other cars. Less recharge, drive longer: this is the recipe for success of the enhanced Porsche 911 GT3 R hybrid. With version 2.0, Porsche works driver Richard Lietz, Marco Holzer and Patrick Long drove in the fourth round of the Endurance Championship for the first victory of the hybrid race car from Weissach. While almost all direct competitors stopped three times to refuel in the pits, the hybrid with just two stops, was victory and checkered flag for the Porsche hybrid. The Porsche 911 GT3 RSR with Manthey Porsche and works driver Marc Lieb, Romain Dumas and Lucas Luhr Manthey-pilot also came with two stops and made the Porsche double victory perfectly. The second race of the 911 GT3 R hybrid in the Endurance Championship in 2011 is the successful completion of the intensive preparation for the 24-hour race Nürburgring 25-26. June. “We are using the technical specifications of the vehicle and the reliability of the hybrid system extremely satisfied,” says Porsche head of motorsport Hartmut Kristen. The focus of the development of the Porsche 911 GT3 R hybrid was clearly on the increase in efficiency. For this, the vehicle weight was reduced from 1,350 kg to 1,300, which even the hybrid components are involved. Their weight was reduced by 20 percent by direct optimization. The general hybrid layout was taken from the 2010 model. The power used in the portal axle two electric motors has been increased from every 60 to 75 kilowatts. Overall, the pilot of the 911 GT3 R Hybrid 2.0 seconds, an additional capacity of around 200 horsepower, which corresponds to a lap on the Nordschleife of an additional conventional capacity of approximately 23 kW (32 hp). The electric power is automatically supplied as programmed when the accelerator pedal. In addition, the pilot, the hybrid-electric auxiliary power to retrieve it manually, for example when overtaking. 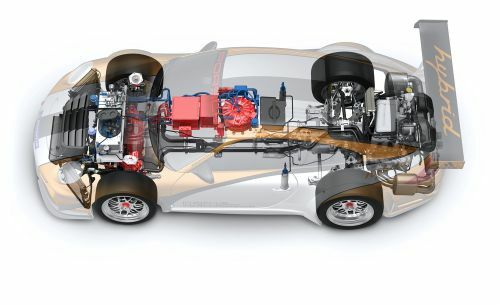 While the portal axle drives the front wheels, was the 4.0-liter, now 465 hp six-cylinder boxer engine that delivers its power to the rear axle, cut back in power, and optimized in terms of fuel consumption. “We ran like clockwork with hybrid penalty,” said Marco Holzer. “The key to success was now near the low fuel consumption and reliable technology that all drivers were on a uniformly high level of the road and have made no mistakes,” added teammate Richard Lietz. 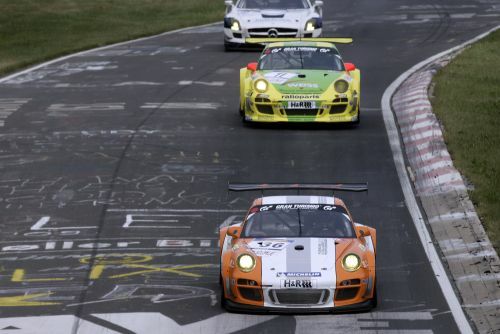 A trouble-free race also went to the yellow-green Porsche 911 GT3 RSR of the Manthey team. With seven seconds behind occupied Lieb, Luhr and Dumas in second place. “This was an almost perfect race. Unfortunately, our 911 GT3 R, the cockpit I’ve shared with Timo Bernhard and Romain Dumas, roughly by a competitor of the runway bowled,” said double starter Marc Lieb..